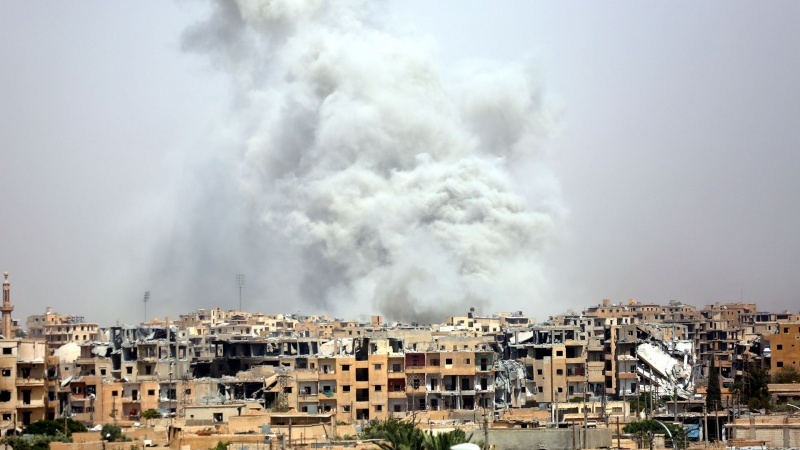 The US-led coalition's attack on Deir ez-Zor Province, eastern Syria has killed 30 civilians on Friday night, two days after US president unexpected announcement to withdraw American forces from war-torn country. Iran Press/ Middle East: Head of the Syrian Observatory for Human Rights Rami Abdul Rahman said that at least 27 of those who were killed were from Al-Shaafah Village. According to Iran Press, eight children were also killed in these attacks, and several people were seriously wounded. Rami Abdul Rahman added the casualties count is subject to increase. These attacks come as US president, Donald Trump has ordered a rapid withdrawal of all 2,000 United States ground troops from Syria within 30 days. Trump's Syria withdrawal announcement has been criticized by US allies, and praised by Iran, Turkey and Russia. Russia President Vladimir V. Putin on Thursday hailed the decision by President Trump to withdraw United States forces from Syria, calling it “correct” because the American troops were not needed. Turkish President Recep Tayyip Erdogan said on Friday that his country would postpone a military operation against Syrian Kurdish fighters in northeast Syria as he "cautiously" welcomed Washington's decision to withdraw its troops in the area. Also Iran's Deputy Ambassador to the UN Es'haq Al-e-Habib, said on Thursday that unauthorized foreign forces must leave Syria.